Global Healing is fortunate to have had many wonderful volunteers and supporters over the years. In December 2018 we will say farewell, and an enormous thank you, to one of our most dedicated: Alice Gruber, who will be retiring from the board after nearly 15 years with the organization. After Global Healing board member Dr. Arup Roy-Burman saw the need for outpatient pediatric care on the Honduran Bay island of Roatán and established the Roatán Volunteer Pediatric Clinic (RVPC) with Global Healing in 2003, he needed volunteers to get it up and running. He soon met Alice Gruber, a pediatric nurse, and her husband Dr. Howard S. Gruber, a pediatrician, who volunteered to go to Roatán in the summer of 2004 to fulfill Global Healing’s vision. Arriving in the 90 degree July heat, the Grubers immediately rolled up their sleeves—literally. Alice spent the first few days cleaning—mopping floors and washing equipment—while Dr. Gruber began seeing patients. “It’s very hands-on work,” Alice says. “You can’t do it from a distance.” The challenges were immediately apparent. The hospital was operating without running water, and children were lined up in the hallway waiting to be seen, many of them very sick. Dr. Howard S. Gruber & Alice Gruber (bottom left) with RVPC volunteers and staff. She recruited Spanish-speaking volunteer doctors from all around the US and Canada, and brought in Honduran doctors who had recently graduated from the main medical school in Honduras. 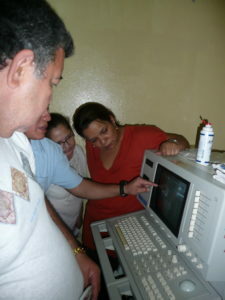 Initially the Grubers and the volunteers worked directly with the Honduran medical graduates. Later, the clinic added one staff person, a local pediatrician. In between trips to the island, Alice volunteered 20 to 30 hours per week from her home in Berkeley to recruit, schedule and coordinate airfare and housing for volunteer physicians, most of whom rotated through for up to a month, with several spending two to three months. After discovering that the six to eight babies born every day at the island hospital were not receiving routine examinations at birth and the mothers were being sent home without any newborn care instructions, Dr. Gruber established newborn exams and well child follow-ups at RVPC. He also instituted a pediatric dental hygiene program with nutritional instruction provided to parents. A special program was established that provided dental varnish at a very early age to each child during their visits to the Public Health Clinics for routine vaccinations. The nurses were taught to apply the dental varnish and with special permission from the Honduran government, record it on the child’s immunization record. Global Healing provided funds for the varnish and toothbrushes as well as donations from other vendors. This program was new to the island preschool children and very effective in preventing dental disease at an early age. The clinic lacked critically needed equipment in the early days so Alice picked up the phone and secured US donations of items such as oximeters to measure patients’ oxygen saturation levels. “Global Healing’s mission has always been to increase the knowledge of the local medical community, and thereby establish better care,” Alice says. “Everything becomes a teaching opportunity.” To that end, the volunteer pediatricians conducted grand rounds in the hospital in addition to caring for clinic patients. The Grubers also developed annual conferences in Spanish on the island, inviting doctors as well as the local paramedics and nurses to gain knowledge in vital topics such as disaster preparedness and pediatric resuscitation. 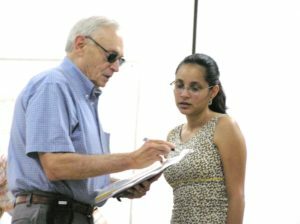 Dr. Howard consulting with Dr. Lydia Prado. 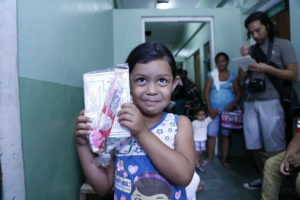 Dr. Gruber was also able to recruit visits by specialists from the US including pediatric surgeons, neonatologists, perinatologists and the Honduran Red Cross plus Honduran pediatric surgeons, all whom provided care to the children and special instruction to the local Honduran medical community. Global Healing continues to support and sponsor the Honduran trained pediatric surgeons who come to Roatán each summer. 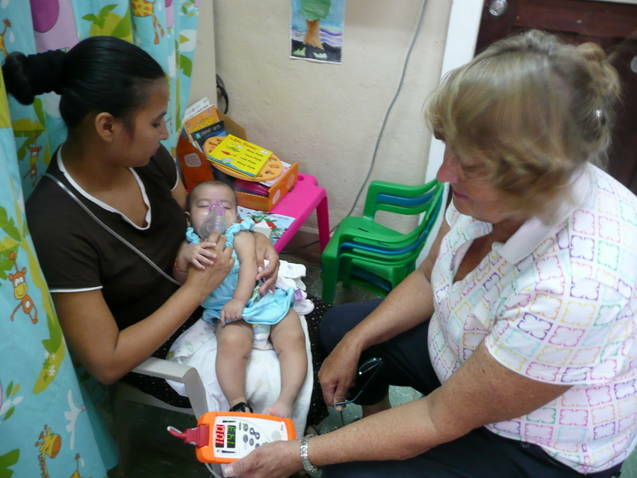 Our Roatán clinic carefully screens these children and there is always a waiting list for the necessary surgeries. Drawing on her ongoing experience in Roatán as well as her M.B.A. in International Business and Finance, Alice joined our board of directors in 2005, and served as the Chief Financial Officer of Global Healing from 2005-2010. 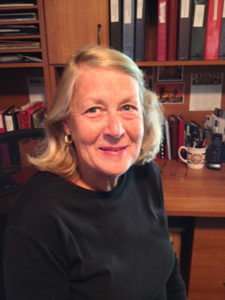 A graduate of Illinois Wesleyan, Alice was named a Distinguished Alumna in 2011 for her work in Roatán. Alice has continued to be an active board member and currently serves as board secretary and is a member of the executive committee. 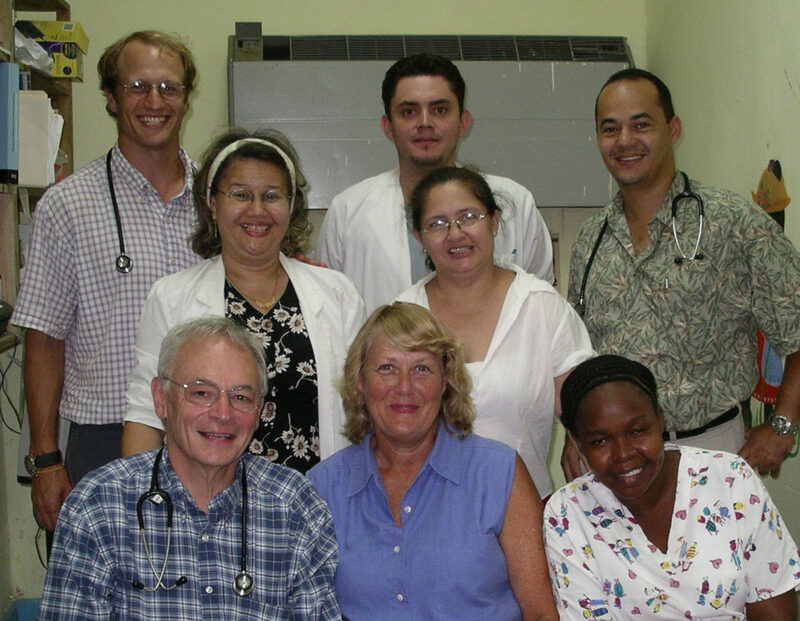 The Roatán Volunteer Pediatric Clinic treated over 30,000 patients while Dr. Gruber was the Medical Director and Alice worked in the clinic. All the patient care was given by our volunteer pediatric attending physicians as well as one or two third-year pediatric resident physicians each month and the local Honduran doctor. No medical or nursing students were involved as Global Healing was there to train the local physicians to promote infant and child health and improve outcomes. The clinic did have one US Spanish speaking student who functioned as the intake clerk. Dr. Gruber also recruited assistance from Engineering World Health, and usually each summer two recent engineering graduates or senior engineering students would come to Roatán to help in the summer. The first day they counted over 120 items of medical equipment they were able to work on and effectively repair. This assistance was greatly appreciated by the hospital and medical staff, especially in the ER and cardiology. Alice with her IT experience was also able to bring the internet to the clinic, and with Global Healing financing, computers and the internet were provided to other areas of the hospital. The hospital was still using paper charts for their records, but the RVPC was computerized and excel spreadsheets began to be used to record each patient visit, the child’s temperature, height and weight, diagnosis and treatment provided as well as medications and lab tests ordered. These ongoing records were very useful in providing the children’s current and future care.